I met Florian Pedemanaud in London several years ago through a mutual friend. He is one of the lucky few who managed to make their living from their passion. 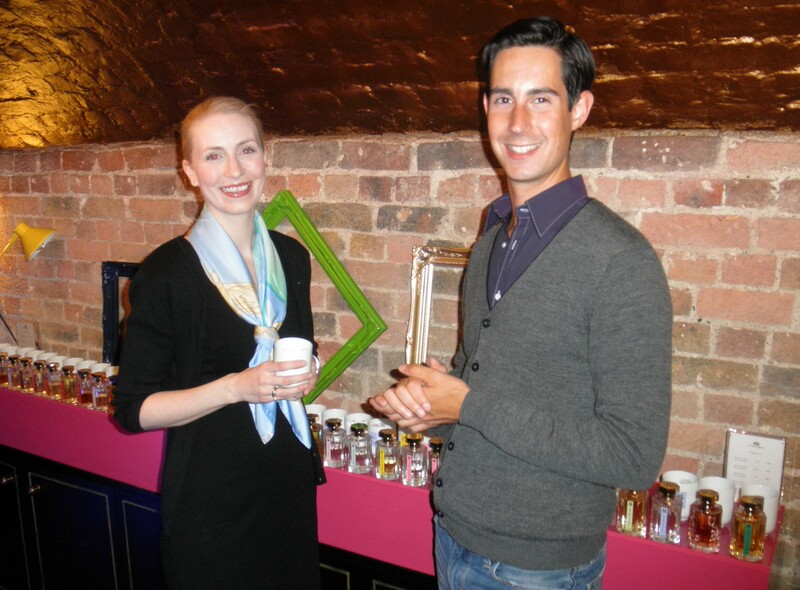 A Perfumista extraordinaire, Florian got his start in the business at Les Senteurs on Elizabeth Street, then worked for Frédéric Malle, Penhaligon’s and L’Artisan Parfumeur. These days he is a training manager for The Orange Square Company, a UK distributor representing brands like Creed, Maison Francis Kurkdjian, Atelier Cologne, Caron, Juliette has a Gun, Ramon Monegal, Mary Greenwell and Coudray. Florian is obviously very easy on the eye, but what I love about him is that his personality matches his looks perfectly. Florian and I in London in 2011. Waking up with TSF jazz radio and a cup of TWG tea and a run in Battersea park. Spraying perfume on my scarf and an umbrella! I can smell! Everything around me, perfumes, nature, people’s perfumes. Eating sweets, candy, Häagen-Dazs ice cream. An old fashioned gramophone to hear retro music. Home, in the south-west of France. You can’t escape your roots for too long, especially if it’s south of France, the stunning countryside and the delicious food. Take tiny samples of various brands to try them and my MOLESKIN notebook to write about them. A glass of gin & tonic, listening to Pink Martini /Ibrahim Maalouf/ Stacey Kent/Chet Baker and lighting a scented candle. I eat an Häagen-Dazs ice cream and open my fragrance wardrobe, then lose myself in smelling dozens of perfumes I have forgotten about, which sets me off travelling in my imagination. Candles. It’s a safe choice, especially with Cire Trudon. Everyday, in little simple things. To continue going to perfume boutiques where I still spend so much money: as though I don’t have enough scent at home… Crazy! Can’t control it! Foie gras and a bottle of Tariquet from my hometown. Another MOLESKIN book, hand cream, iPad, and a different fragrance to spray my bed every other day! A nice show/concert in town. My parents. Their motto is: work hard, be passionate and you’ll go far. How do you manage to stay so fabulous Florian? Oh well, it’s just me! Oh well, it’s just him! 🙂 That last comment is pure, lovely Florian! He is fabulous indeed and just about the cutest person I ever met in Perfumeland. Thank you for your time, Florian! I think Florian is fabulous too! What a wonderful interview. I was riveted to every word. He is a great guy! Glad you enjoyed the inteeview, Lanier! I haven’t had a coffee yet and read Florian’s answer to the getting out of the house question as “spraying perfume on a scarf and on an umbrella”. I thought that’s a great idea…, no? You know the foldable umbrellas that have a cover? If you spray the inside of the cover with a perfume you like the night before and keep your umbrella inside, then you get an amazing whoosh when you open your umbrella the next day! I am with Lady Jane Grey and will have to stock up on some ice cream. Great answer. enough trouble staying away from cake! I agree with LJG, I need to add Häagen-Dazs ice cream to my bad day survival plan. Florian is very stylish and sounds a lot of fun. Really loved reading his fascinating list of favourite perfumes. I’m sure he had a hard time listing only those few… I believe his collection is amazing! I could´t come up with a list of perfume that long – what is wrong with me????? Nice interview. Mingled with Lutens and Serge. I mean Chanel and Serge …. too early! Lovely interview and valuable addition to the collection of interviewed people in perfumeland. He’s not only impeccably stylish, but has GREAT taste in perfume, ice cream and music! I love many of the fragrances Florian listed – and Häagen-Dazs is also my favorite brand of ice cream (and I’m a big fan of Stacey Kent. She’s got a beautiful jazz voice). I remember that photo of you and Florian from your original post, Birgit – it’s nice seeing it again, you both look so elegant!!!! I like that photo too – we look happy, and I can’t speak for Florian but I remember that this was a very happy day indeed. Glad you could relate to many things in this interview, Suz. He has made a great career for himself within the industry. A great interview. Loved the list of favourites, most people are reticent about even naming one – and very interesting to see Dune listed (which I’ve been testing lately). And the umbrella idea! Such fun, and could be a great way to test out perfumes. I’m beginning to think (after so many years) that spraying on a wrist and sniffing is just not the best way at all. It’s the smell left in a room, or on clothes the next day, that’s the real deal breaker. If the whoosh on opening the umbrella doesn’t lift my spirits, then maybe it’s not one for me! I think the um rella spraying is a really great way to experience a perfume and to brighten a rainy day all at once.